I don't know if I'm really devoted to collecting baseball cards as much as I like the idea of being able to say I still collect after all these years - it seems tough to set goals or at least ones that will stick through next year. At times I do not want anything to do with collecting - I realize cardboard pictures of men isn't where it's at and I shudder to think that is all I care about after 15 or 20 years, while other people have moved on. 1.) I think too much about collecting, I read the blogs, peruse the forums - without actually enjoying it. 2.) If I buy a random box of cards, unless I pull something - I'm just paying towards someone else getting the big hit out of a product. If pull a big hit, then it probably will not be worth as much in a few months. 3.) Random hits are worth $0.99 plus shipping on eBay - no matter how much I talk particular ones on my blog. 4.) My favorite players are more successful in their life, than I am in mine - collecting their cards is a reminder of that. 5.) One day I'll be buried in my cards - who knows where the cards and I are going afterwards. 6.) Listing collecting goals for a particular year falls flat - when there is no money or interest to pursue them. 7.) I don't know what not 'being able to polish a turd' means - so I keep picking up crap cards [repacks, loose packs from the 'junk wax era', etc] and convince myself I can do something with them. 8.) My only option for opening packs is retail - but the ones at Target or Walmart are mostly searched. 9.) Picking up a few base cards of my favorite players doesn't really amount to much - I've hit the ceiling. 10.) I'll be more than 10 years older - than some of players I'm currently or will be collecting. 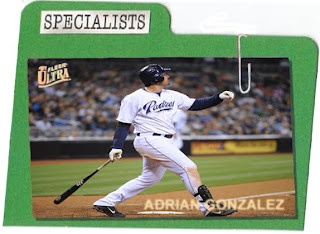 I wanted to try something a little different and used an insert card from another sport [football] to create a custom baseball card of San Diego Padres first baseman Adrian Gonzalez - I think the actual inserts correspond with colors from a particular NFL team. I like the cards because they are die-cuts - a file folder graphic used on the original inserts with a faux paper clip going through the image used for the cards. I'll have to go do some 'research' to see what if there was a 'theme' to the Specialists inserts - though I assume it was another run of the mill insert set. At this point of his career, is Tommy Hanson comparable to someone like Roy Halladay? Experts have made the comparisons and it remains to be seen if Hanson can fulfill some of the potential he has shown so far. Considering a rookie's potential ceiling and whether he has the foundation of skills to develop into a better player past his rookie campaign is important - to predict future success. Has a particular player gotten by because other he hasn't been exposed a second time - and in his rookie season, has already peaked? Detroit Tigers rookie pitcher Rick Porcello doesn't have the punch-out stuff of a Tim Lincecum but Porcello was all of 20 years of age when he pitched in the Major Leagues, so there is potential for him to be better at 25, than at 20. For starting pitchers, looking at their stuff is one key to predicting success - starting pitchers who enjoy success in the minors [maybe a pitcher who posts nice won-loss records] but don't throw hard at all don't have as much potential as pitchers who throw hard [or basically have pure 'stuff']. Toronto Blue Jays rookie Ricky Romero has a solid rookie campaign, though it took a while for the first round pick to get to the Major Leagues. On the other hand, guys who throw hard need command - otherwise they don't get anywhere. St. Louis Cardinals outfielder Colby Rasmus' ability to make adjustments will dictate his potential ability to star in the Major Leagues. For position players, the rookies who don't make contact and strike out a lot are not likely to have long-term success - however if a player is young enough and smart enough, the better ones make the adjustments. The position players who are rookies should be good athletes - though to improve, it takes skill and not just pure physical ability. I think this is where all the coaching and guidance a player has received may pay off - if a particular rookie has been told for his life just 'to play,' he might be at a disadvantage over another player who has received instruction as well as played organized baseball for much of his life. Pittsburgh Pirates outfielder Andrew McCutchen provided a nice mix of athleticism and ability in his rookie season, giving Pirates fans a reason for optimism. The New York Mets signing of pitcher Kelvim Escobar to a one-year deal officially means the end of his six-year tenure in Anaheim - he has missed all of the last two years, except for one start in 2009, but was underrated part of the Angels rotation in his three healthy seasons in 2004, 2006 and 2007. The Mets probably don't know what they are getting in Escobar - but they are hoping he gets in a full season in the Major Leagues, either as a starter or a reliever. I took the picture at an appearance he made at a Orange County, California auto dealership - the last time I got his autograph was this past year in spring training, when he was driving out of the Angels' complex in Tempe Arizona and was stopped by some acquaintances to talk. Is San Diego Padres rookie pitcher Mat Latos the next Jake Peavy? Will Toronto Blue Jays rookie Marc Rzepczynski enjoy long-term success in the Major Leagues? Rookies starting pitchers who slotted to be a No. 1 or No. 2 guy always have more potential - as opposed to pitchers who fill out the back end of the rotation. Will Daniel Schlereth fall into relative obscurity if he doesn't become a closer? Relief pitchers are not collectible unless at the very least, they have potential to close - if a minor league pitcher doesn't have any starts or saves to his name, then he isn't likely going to be a star [regardless of a player's real-life potential to be useful if he reaches the Major Leagues]. After being a shortstop in college and a third baseman in his rookie season in 2009, Chicago White Sox rookie Gordon Beckham probably has the potential to be a similar player to Dustin Pedroia at second base. For position players, consider how a team sees a rookie - was an up-and-coming player a highly touted prospect who was a first-round pick or merely a minor leaguer having a good season in the minor leagues getting a courtesy Major League promotion as a reward. A rookie who will probably have long-term success is probably a player who can plugged into playing one position for the next five to 10 years - rather than a rookie who is already seen as a utility player or a guy who may not be able find an ideal spot on the field to play and if playing in the American League, maybe slotted to be a full-time designated hitter. For position players, rookies who can play up the middle may have the most potential - maybe a shortstop, since the position is probably the most athletic on the field. 2009 Topps T-206 rack pack breaks [$4.99 each / four packs at Target] - because I had a $50 gift certificate, which was another impromptu [this time for Christmas] present from my father, I was able to splurge on four packs among other purchases. I picked up a base set already so I was hoping for some random hits - though these rack packs are retail, so it is always a crap shoot. I only listed the minis and one or two notable base cards - this was probably a 'meh' break, but I guess I'll deal with it. Garrett Jones provided some sock as a rookie with the Pittsburgh Pirates in 2009, but he was also 28 years old. Collecting baseball cards, I'm trying to apply definitions as far as being able to tell whether or not particular rookie players are going to be good or not - I've heard of top prospects, but what about the other players coming up through the minor leagues to get some extended playing time in the Major Leagues? Three basic things I look for and will try to outline as far as being able to eyeball rookies who will have the best long-term success - include age, role and potential. If a player is still in the the minor leagues entering the age of 25 or older, it probably means he isn't a top prospect - if a player is a MLB rookie at 25 or older, it means there maybe more injury concerns, thus limiting potential. There are always going to be exceptions to the rule, but MLB players who debut at 25 or older probably will not have the long term success at the Major Leagues. If a player is still in the minor leagues entering the age of age 24, it probably means it is close to make or break as far reaching the Major Leagues - if a player is a MLB rookie at 24, it means it probably means it took some time to eliminate holes in his game and a team may have a solid player, but the potential for being a star shrinks. If a player is still in the minor leagues entering the age of 23, the player still has some time to put together a season warranting an eventual call-up, especially if he is in AAA or AA - if a player is a MLB rookie at 23, it seems like ideal age for a player who has put his time in the system, to come up and still develop into a star. If a player is still in the minor leagues entering the age of 22, the player still has some time to put together a season warranting an eventual call-up, especially if he is in AAA or AA already - if a player is a MLB rookie at 22, it seems like ideal age for a player who is going to be pretty good and is at least destined to make one all-star game. If a player is still in the minor leagues entering the age of 21 or younger, the player is basically unproven and maybe reports from experts at Baseball America is what to go on - now if a player is already a MLB rookie at 21 or younger, it seems like ideal age for a player who is going to be pretty good as a potential all-star type talent, probably even better. Neftali Feliz was a phenom in 2009 and the only question is how long the Texas Rangers will keep the young man in the bullpen - it will be interesting to keep an eye on him, particularly if he stays on track. Derek Holland had an up-and-down rookie campaign, but dominated in an Aug. 9 start against the Halos - he is probably future No. 2 or No. 3 starter. Julio Borbon looks to play in his first full season in the Major Leagues in 2010 - after getting a 46 game, 157 at-bat audition this past season, where he hit .312 with a .376 on-base percentage. He also hit four home runs and drove in 20 runs. I used to believe he is related to Pedro Borbon Sr. - but all the both of them share is a last name. I have mixed reactions when I pull retro players from current year products - I feel like if I didn't have the access to pulling the original cards [as in released in 1909, 1952, 1959, 1960 or whatever year] of retro players, then associating 'value' to the process, I don't have as much fun pulling cards of retro players, if it is just going to be another card in a set [and not really worth anything]. For deceased players - pulling their cards out of a current-year product is a problem because they have passed away. For players still living - most charge a chunk of change to get a basic flat item signed, so it is really a challenge to get a card signed for example, without having to pay a minimum amount for their signing fees at a card show and/or through a private signing. Of course, I would have no complaints if I pulled a retro players' card - featuring a piece of game-worn memorabilia card or a cut autograph. It maybe unreasonable, but regardless of style of set [i.e. a tribute to a past trading card product or design] - I want current day product to featured more current day players. I still want my current year, retro themed products - but to keep the retro player content to a minimum or be in a product of their own. It would give the old school guys a proper 'tribute' and give me a choice as far as picking up a trading card product - slanted towards active players. My irrational longing for card #U35 picturing Matt Wieters led me to this lone blaster at a Target for $19.99 - it seems like the only baseball blasters were Fan Paks and one blaster of 2009 Topps T-206. I had a $25 gift card [which was passed down to me for my birthday as an impromptu present from my father] burning a hole in my pocket - I looked for the Upper Deck Series 1&2 combo packs blaster box at another Target and couldn't find it. When I finally found one, it just felt right to pick it up - though I could be looking for a base card [maybe worth $7-$10 right now] of the next Eric Munson and not the next Thurman Munson. There are 10 packs in each blaster featuring 18 cards per clear plastic wrap pack - including two Generation Now inserts, two Upper Deck Update cards and one 20th Anniversary insert. The Upper Deck Update cards seem like UD's response to Topps' inclusion black/Throwback parallels in retail blasters - as far as I know, the Update cards [50 in the set] from Upper Deck only come in Series I&II combo fat packs and in blaster boxes. I started ripping once I got in the car - after nine packs and 162 cards in, I was down to my last clear plastic wrap pack and conceded this break might very well be a 'bust,' since I hadn't pulled the Wieters card that had been the object of my lust. Seriously, was I going to be stuck with the packaging - as the only tangible thing picturing Wieters I could keep? Seriously, why do I care about a base, non-autograph, non-serial numbered or limited parallel card of an overhyped top prospect - who did have a solid, if unspectacular rookie year. Instead of thumbing through the cards from the front, for the last pack, I thumbed from the back - the first Update card was Mat Latos and second Update card, in the final pack was Wieters. I didn't faint or anything like that but was relieved I had the card in my fat, grubby hands - frickin' mission accomplished, Chief. Forget Joe Mauer, forget Albert Pujols, forget Vladdy Guerrero - if I was starting a 'Dream Team' right now, tennis star Maria Sharapova would be at the top of my list. 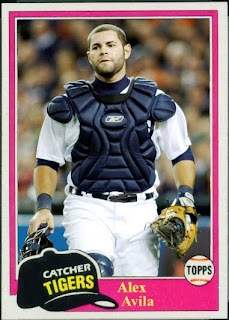 I like the 1989 Topps K-Mart Dream Team because the pink background on the stripe where her name is implies a more a feminine quality to the card - the cards sort of have a tacky look to them with a 'Dream Team' heading and the K-Mart logo. Still, it isn't exactly a mainstream card - which makes it sort of unique for the purpose of generating this fantasy rendition. For baseball fans who grew of age in the mid 1990s, Gomes reminds me of Dante Bichette - both seem like righty mashing meatheads who kind of take a pose once they know they've connected. It remains to be seen if Gomes will ever be given a full-time job in the Major Leagues, but he packs a ton of power in his swing - kind of fun watching him sit on a pitch and crank the ball far and deep, even though I might see on a highlight or a clip online, as opposed to in-person or a game broadcast somewhere. I claim ignorance as to knowing who this Pixie is - maybe if she was an politician, actress, model, athlete, maybe I would care about the little factoid on the back of Gomes' trading card. The Angels apparent signing of Fernando Rodney to a two-year deal maybe a sign of desperation, since they've had nothing to show for their off-season - except losing third baseman Chone Figgins, losing ace John Lackey, losing key reliever Darren Oliver and maybe signing an aging slugger [Hideki Matsui]. However, the Angels really needed to fix their bullpen since it was pretty much a mess in 2009 - Justin Speier was released, Jose Arrendondo imploded, while Jason Bulger and Kevin Jepsen were unknown commodities entering the year. Scot Shields was out for much of 2009 his better days might be behind him, so the Angels hope Rodney can be a building block - a hard-throwing reliever who can serve as a veteran presence and allow fellow reliever Jepsen grow into the role of a set-up man [and eventual Halos closer in due time]. Brian Fuentes is still lurking around as the closer but if he struggles - Rodney can step in and pick up some saves here and there in 2010. Rodney also allows Bulger to continue to be a middle reliever, a role Bulger excelled at this past year. As long Rodney keeps his head on straight and doesn't make a habit of throwing a ball into the stands - he is probably of some use to the Angels. I had the autograph card - signed by Rodney before an Angels vs. Tigers game this past year in Anaheim. I could have seen Darren Oliver going to the Yankees or some other team willing to ensure [for the next couple of years] - he makes a little more money than he is currently making. Apparently, Oliver is now close to signing with the Texas Rangers - an organization he started with and a team closer to home in the state of Texas. For three seasons, the Angels reaped the rewards of Oliver's late-career resurgence as a reliever - pitching in 61, 54 and 63 games from 2007 through 2009. He was the underrated part of the Angels' bullpen and it remains to be seen if another cog that has been poached from the team - will be replaced by a player of equal ability and skill. As for the autograph card - I found the Donruss Press Proof parallel out of a quarter box in a card shop [it seems obvious the card doesn't scan well] and I had Oliver sign it before an Angels' game this past year. Roberto Alomar c/o home address - signed one card in blue Sharpie and didn't return the other [2004 Topps Cracker Jack]. Alomar was considered one of the best second baseman in Major League Baseball history - a defensive wunderkind and an explosive top-of-the-lineup catalyst through his prime, he helped the Toronto Blue Jays win back to back championships in 1992 and 1993. I received this request on Dec. 21 after a two or three week wait - this knocks out another 2001 Fleer Tradition autograph card and I've been working on trying to get cards from the set signed for about the last seven years. Alomar was one of the guys who I have missed and just never got in-person when he was an active player - though I do remember another through the mail request sent and received back in the late 1990s, when he was still with the Baltimore Orioles. 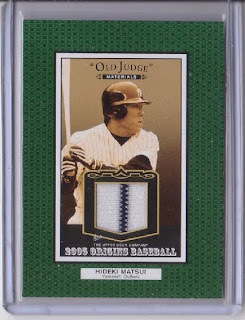 Finding a way to add new cards to the teams/types/players [I'm currently collecting] was one of my collecting goals at the beginning of the 2009 - however, I kind of tend to lose track or neglect what types of cards are out there. I'd probably annointed Vladimir Guerrero my favorite player to collect for the last five or six years - even though I'd conceded he had a personality of a rock when it came to dealing with most fans off-the-field. However, there will always be mad respect to the guy who has a wacky strike zone and the innate ability to cream the ball a long way - for my home team. I just don't know if the enthusiasm to collect has stagnated to the point I really don't care anymore if I pick up one more card picturing him - that seems a little odd, but I dodn't have enough interest his in base cards or low-budget [$1-$5] parallels/inserts/GU. However, I'm less enamored by seeking particular cards out, if I have to pay more than I am willing to spend - that may mean not anymore than $20 on any single card purchase. I've always wanted one 'nice' Vlad but didn't pick one up in 2009 - maybe a button, superpatch or unique auto card. I didn't end up finding 25 Vlad inserts/parallels/patches in 2009 - cards picturing him on the Halos. 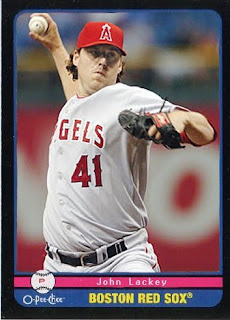 With Vlad likely leaving the Angels, I wonder if my interest in collecting 'his stuff' will continue - but I guess now, there will be a time period to focus on, as far as collecting Vlad's cards related to the time when he was a Halo. Maybe I just need to flip through the Vlad cards I have in my collection - just to remind me the moments he had as Angel. My choice as the worst card of 2009 - the least he could do was keep his eyes open or at least a better image should have been chosen to manipulate. Here is an update to an image I just put together - the font on player's name was off on the original rendition and I wanted to create a more faithful manipulation, so the card looks a little bit more authentic. Brett Wallace is a slick hitting, particularly rotund prospect - who was recently traded from the Oakland Athletics to the Toronto Blue Jays for outfielder Michael Taylor. Wallace was the key piece acquired from the St. Louis Cardinals in the Matt Holliday trade last July - but apparently Oakland's front office conceded Wallace was a guy who realistically has no shot at sticking at third base and was a future first baseman/designated hitter type. However, it seems like a make or break year for Oakland first baseman Daric Barton to stick in the Major Leagues next year - with top prospect Chris Carter coming up from the minor leagues sooner than later. I like the 1990 Score McDonald's because it is an oddball card - right now, I'm just trying to get the ball rolling and generate different 'make believe' trading cards of various players, so I can sharpen my skills. Alex Avila had a pretty good debut season in the Major Leagues in 2009 - though it remains to be seen if he replicate his success, when given the opportunity to stick for a full season. I don't particularly like the 1981 Topps design, but wanted to see if I create a 'card' of Avila - using a the graphics of a nearly 30-year old card release. More or less, the beat goes on for the Los Angeles Angels of Anaheim - two of the team's 'core players' gets poached by Seattle and Boston and they go out and plug a hole by signing veteran Hideki Matsui to a one-year deal worth around $6.5 million. Losing Chone Figgins and John Lackey isn't really great, especially when the Angels were out of play as far as landing a pitcher like Roy Halladay or even Cliff Lee - however signing Matsui gives them a slugger who can be patient enough to take a walk [like a Bobby Abreu], but hit the ball out of the park. Obviously the key to Matsui is his health - will he be able to play 120, 130, 140 games as the Halos primary designated hitter? At this stage of Matsui's career, there is no way he should be playing the outfield. The Angels will be fine because they have a pretty good system in place - as far as the manager, the starting rotation and how young players are eased into the starting lineup. Hopefully the signing of Matsui is part of a bigger plan to win more than just the American League West - though it remains to be seen what the Angels' next move will be. I've been dabbling with the idea of creating my own custom [or tribute] cards and while I'm a total newb, I hope to learn and gain some expertise - just to come up with unique images of trading cards, I'd never pull out of packs or find as singles anywhere, because they exist only in fantasy. I didn't know how to really make these fantasy cards, though reading a tutorial on making your own baseball cards - inspired me to mess around on Photoshop and see what I can whip up on the fly. I wanted create a Buster Posey card since he is probably going to be one of the top rookies in 2010, but he came up too late to have a 2009 MLBPA Rookie logo card produced - it is still a mystery, how any of the 2010 UD cards are going to look, especially if it is only licensed by the Players Association and not Major League Baseball. For me, the most interesting aspect of custom/tribute cards is the ability to manipulate an original trading card design - it blew my mind to think custom/tribute cards using certain trading card designs were created by scratch. With the most basic custom/tribute cards, all I really had to do was find an image/scan of a trading card - and change certain qualities on the original card, through an image editing program like Photoshop. I can remove an original image on a trading card, but still retain the basic graphics as a template to layer onto a suitable image - before I do anything else, I have to make sure the image is proportional and not stretched. It is kind of fun trying to cobble up something together - I'm not going to get every single thing right, but creating custom/tribute cards seems more fun than maybe simply consuming, purchasing, buying, picking up new cards. 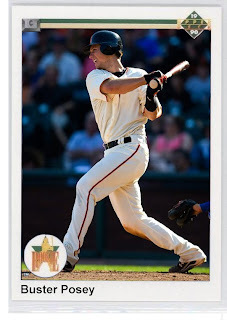 The Posey 'card' is designed with the idea UD creates an insert set of 2010 rookies with the 1990 design and old school Star Rookie logo as a tribute [maybe as a potential 'Fat Pack' insert] - Posey's potential would definitely land him the No. 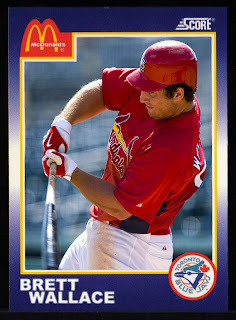 1 spot for 2010, if UD still had its Star Rookie subset after all these years. There are a lot of things I can say about John Lackey - though I choose to look forward to what the Angels have to do, since they've lost their big gun on top of the starting rotation. The most disappointing thing about losing Lackey, who apparently signed a five-year contract with the Boston Red Sox, is the Angels never pulled the trigger on a trade for Roy Halladay - if talks were taking place over the winter meetings, then the Angels should have jumped at the chance to trade four or five spare parts, for one staff ace. 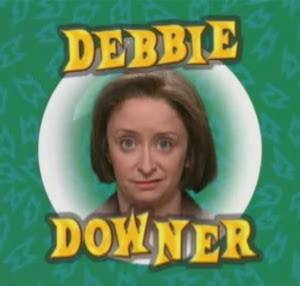 Maybe the Angels are one more starting pitcher away [Derek Lowe, Javier Vazquez, Jair Jurrjens, Matt Cain?] - from basically having the same rotation that led to an American League West title in 2009. It isn't doom and gloom, since the Angels still have four competent starting pitcher - the trade for Scott Kazmir this past season looms larger, especially if he can match Lackey's numbers. The fact Kazmir probably can't match Lackey's intensity is good in the sense - he won't be showing up his teammates, his pitching coach and manager if things aren't going his way. On the other hand, the fact that Lackey is an ornery son-of-a-gun is what makes him the pitcher that he is - the positives of having the starting pitcher with a little swagger and a lot of attitude is what the Angels will probably hard pressed to recapture. Jesus Guzman, who was signed by the San Francisco Giants as minor league free agent - hopes he gets an extended opportunity in the Major Leagues in 2010 after finally reaching the Major Leagues for a cup of coffee this past year. Travis Ishikawa put together a middling season as a rookie in 2009 - the first baseman got a 12 game, 24 at-bat cup of coffee in 2006, played in 33 games and got 95at-bats in 2008 and I guess was still eligible to be a rookie since he was named on Topps' Rookie All-Star team this past year. San Diego Padres' shortstop Everth Cabrera may turn into a pumpkin in 2010 - but an unknown commodity coming into 2009, as a Rule 5 pick from the Colorado Rockies, he put together a solid rookie season. It isn't a stretch to say, Cabrera's biggest moment in his rookie year - was hitting a walk-off grand slam home run against Francisco Rodriguez and the New York Mets last August. Instead of trying to mess around with loose packs and blasters, not even being able to complete a set in process and ending up with doubles, triples, et al - I picked up a hand-collated complete set of 2009 Topps T-206 for the price of around two blaster boxes, probably a few bucks more. As I go through the cards to talk about [like others here and there] - there was no way this Hamilton card was going to escape my notice. A quick story I remember is I'm in Surprise Arizona this past year, trying to get Texas Rangers' autographs in spring training - Hamilton was signing autographs for fans and as he was moving from one section of the railing to the other, I think he actually chipped his tooth trying to hold up a soda can. That is my Hamilton in-person story for the year - it is fitting Topps gets a picture of Hamilton balancing a bat with his teeth, because it seems to capture who he is. This image used for Thome maybe a preview of at least one type of image Upper Deck will be using in 2010 to skirt past the issue of not being licensed by Major League baseball - it seems like the image is boring because Thome is looking out at something, maybe towards the end of his career and he is just in a daze. I will not try to foist any sort of significance on the 'retro-style' card since it is one I assume pictures this brave, old-school, heroic baseball warrior at the twilight of his successful baseball career - I do wonder if the original image used actually pictured Thome with the Dodgers or it was created from a White Sox image. If 2009 was his last Major League season - he ended it as a pinch-hitter on one leg instead of this guy who'd emerged big and strong through his prime years with the Cleveland Indians. Xavier Paul probably will not have an opportunity to get significant playing time in the Major Leagues, at least with the Dodgers - with Manny, Matt Kemp, Andre Ethier patrolling the outfield at Dodger Stadium, along with Juan Pierre still lurking as a valuable [if generously overpaid] fourth outfielder. Paul has put up solid, but unspectacular numbers in the minor leagues and made his Major League debut in 2009 - his upside is he is only going to be 25 next year and he is cheaper than Pierre, who could be traded to a team willing to take on a chunk of his salary. Though Paul's 2009 Topps Heritage High Numbers card has the MLBPA Rookie Card logo, his first card was [#77] in the 2003 Bowman Draft set - as a collector, I still consider the 2003 Bowman Draft card as his true rookie card, since it came out before the MLBPA Rookie Card rules were introduced. This past season, Jake Fox burst upon the baseball scene in Chicago with eye-popping numbers [check out his splits] - he posted in June and July. However Fox bottomed out the last several months and finished the 2009 season with a .259 batting average with 11 home runs and 44 runs batted in - it seemed like he could hit for a bit of pop [.468 slugging percnetage], but obviously wasn't going to be in the Chicago Cubs' future plans when he was traded with Aaron Miles to the Oakland Athletics for three prospects. Though he is playing for a division opponent - I will interested to see how Fox does in Oakland if given a legitimate opportunity to play every day [at the very least get 400-450 at-bats as a DH perhaps]. I had a Heritage High Numbers chop shop going once I started going through the 185 card base set - trying to break the set down and figuring out what I'm going to do with each card. One of the cards I was glad to finally have in-hand features Arizona Diamondbacks rookie Clay Zavada - his journey to get the big leagues and his moustache have turned him into a fan-favorite of sorts. I picked up a Heritage High Numbers base set with none of the shortprints listed - so from a list I found here, I was figuring out which SPs I may have possibly wanted [in bold/italics] and would like to pull in loose packs, just to have in-hand. 2009 Topps T-206 retail [$2.99 each / one pack at Target] - I was able to find a sealed box on the shelf and had to go through the pomp and circumstance of having it opened up [to grab just a lone, lonely pack because it was all I could afford to pick up], so it wouldn't seem like I was doing something shady. 106 Jeff Francis - great start, a card of a guy who hasn't played in about a year or more. 235 Yovani Gallardo Polar Bear mini base card parallel - according to the listing on the pack, Polar Bear parallels are found one in every 10 packs. 74 Greg Golson thick gold filler card- not pictured. 171 David Wright - this card is sort of ugly, it looks like Wright is grimacing with his eyes closed as he is following through. 130 Honus Wagner - probably the main reason the legacy of the T-206 lives on through the 21st century, never mind he is probably considered the best shortstop in the history of the game.